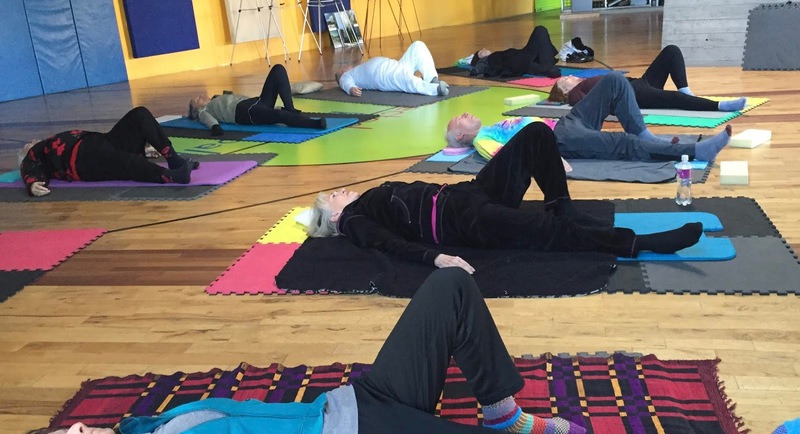 Feldenkrais Method® classes and private sessions are a powerful way to find healthy aging with better posture, movement and pain relief - in shoulders, back, knees, hips, legs, feet and more; improve balance, mobility and posture, recover from injury, illness, stroke, delay/avoid surgery and heal faster. You'll improve alignment, comfort, arthritis, spinal disc degeneration, MS, scoliosis, stenosis and more. Contact Carole Bucher, BA, GCFP. The only ongoing Feldenkrais in Northern NV since 2009. A perfect lesson for computer shoulders and neck, BC. Class this week -- a 50 sec. video of class at the Reno Buddhist Center. A really lovely lesson that opens the chest and arm pits, expands your shoulders and ribs, as it lengthens neck, spine and torso. These movements reduce stress, improve breathing, as they integrate and coordinate the movement of the whole body, from feet to pelvis to head. We are doing the lesson again on Saturday at 10 am, at 250 Bell St. Park and enter in the front of the Cathexes Building. And remember, there is no Saturday class on April 6. I'll be in the Bay Area at a Feldenkrais Guild of North America function. Please contact me (using the form on this website, Renofeldenkrais.blogspot.com) if you are coming to your first class or if you have questions. I will write you back and send you the class handout. I will be away at a Feldenkrais Guild of North America training/meeting the 5-7th, and thus will have to cancel class on Saturday. My sincere apologies. I do wish one or more Feldenkrais teachers / practitioners would move to our area! As an alternative, you are welcome to come to class Tues noon at 250 Bell or Thurs 5 pm at the Reno Buddhist Ctr. You can use the contact form on this site to let me know if you have questions. I am continuing an awareness focus on increasing whole body flexibility, easier movement and balance, counterbalance and general fitness/wellness. All of these lead to pain and tension relief and, of course, better health and more comfortable, confident living. Hope to see you soon! A wonderful resource for calm, centered responses to daily life. Practicing quietude, meditation and any form of self-awareness helps us to build up a better subconscious response to the physical and mental impacts of shock, large and small. Staying with the sensation of the body helps us ground and occupy our physical space in a way that supports better emotional and mental health. We work on this in every Feldenkrais class. Self-awareness increases your ability to stay with yourself and our wandering attention as we practice meditation. Here, I am sharing a short video from Feldenkrais and nature, brain-body specialist, Annie Thoe, with her permission. She has many wonderful short ATMs you can do on her youtube channel. These are a great resource, especially when you aren't able to attend a Feldenkrais class, but want or need support for mental, emotional and of course, physical stability. We need such resources in the midst of the world we now live. Annie has this to say about her video: "This quick video has a powerful Sensory Awareness lesson based on the Feldenkrais Method® using hands to create mental and physical balance. [Instructor Annie Thoe, Feldenkrais Practitioner demonstrates a technique using your hands with a mind-body approach to "shift" the mental space your are in to a place of better balance, calmness and serenity.]" Meanwhile, continue to keep your feet on the ground and stay in touch with your skeletal support so the rest of you can stabilize too. You can use this simple exercise from last month's newsletter to help you do it, even as you stand in line waiting. No one will really notice. 1. Stand and notice which leg and foot you stand on more. Shift your weight from foot to foot. Feel the difference. 2. Visualize the lines of your legs, from your feet to knees, to your pelvis. 3. Wiggle your toes, feel how the bones in your feet and ankles provide support for the rest of your body. 4. Notice gravity coming through the bones in your feet; practice standing with pressure on different parts of your feet. Hold onto something for stability; keep your movements small and slow. 5. Revisit these skeletal connections often and re-experience them. Our connection as a community of learning, growing and caring people is our best resource for staying in touch with the deeper meaning of our daily lives. You may call me to discuss your situation or reach me easily via the contact form on my Renofeldenkrais.blogspot.com website. Our Awareness Through Movement® class this week is an extension and expansion of last week's wonderful lesson, and a gentle wake up call for the whole body. It is a wonderful lesson for anyone who has had joint replacement surgery anywhere in the body. The class is also related to my recent post on facebook, 'Freeing the Hips' by Cathy Paine. The initial focus is on working sensitively but clearly with the feet and legs, tracking the movement through the rest of the body, especially shoulders and neck, and then coordinating movement of the head. The coordinated sequences help to activate refinement in our motor skills, while freeing and release muscles. The work also creates a greatly enhanced platform of balance for the body. The lesson also softens our use of force through our hands, wrists and arms, as we gently roll the head with our hand/arm instead the neck, keeping our attention spread throughout. At the same time, the work with the head also allows a release of the muscles along both sides of the cervical spine and into the shoulders. Additional work with the arms, arm pits, spine and upper chest make this a whole body lesson in the best Feldenkraisian sense. The work of the feet connecting into the hip joints also initiates release and organization from the feet, ankles, knees and legs below. All in all, it is an extraordinary lesson of great richness and nuance..
Next classes are Thurs. 5 pm at the Reno Buddhist Center, and Sat. 10 am. at 250 Bell St. Please use the contact form above to reach me if you have questions or are new, or to receive the class handout. What the Feldenkrais Method® stands for, literally. Your skeleton provides basic human functional strength and when aligned well, allows your muscles to also function appropriately, meaning to pull in a balanced way through joints, minimized spasms and pain. As you learn to feel yourself skeletally in movement, you will discover what your movement patterns and habits are-- the ways you use your body that most likely contribute negatively to issues or concerns you are experiencing now. Once you know how you move, what those patterns feel like, you can learn to sense when your body is or is heading in a direction of misalignment. You can learn movements that will permit you to realign yourself gently, over time, so that the alignment and your movement patterns are synchronized, your body more balanced and stable and you have less pain. If you would like to attend Feldenkrais® Awareness Through Movement® classes or have questions about your situation, the Feldenkrais Method® or Functional Integration®, my training, or related, please contact me using the form at the top right hand side of this page. I will send you a class handout, or set up an informational telephone appointment, or get back to you via email. You can also find me on facebook at Reno Feldenkrais Integrative Movement, Carole Bucher, and https://www.meetup.com/Reno-Feldenkrais-Awareness-Through-Movement-classes/. For new people or people who can't come often, or need a grounding, reaffirming Feldenkrais class -- this week is for you Tue, Thurs, Sat. Dear friends, ongoing students, new students, and potential students! Next week’s (Feb. 25-Mar 2) Feldenkrais Awareness Through Movement class is a short, simple and whole body class that provides comfortable movement in hips, legs, knees, feet, spine, neck, chest, arms and shoulders. Pretty much everything, but especially organizing in feet, legs (and knees), hips and pelvis. It is a straightforward lesson that is a particularly good one for people who need grounding and balance, or who are new to Feldenkrais or may have started class when we did a more complex, longer or vigorous lesson. This class will take you in a simple way into your whole body, help you feel a deeper sense of the dynamics of your posture, flexibility, balance and stability. It will pave the way to a new understanding of your skeletal support and structure, and so is a good introductory lesson and reinforcement of basic Feldenkrais principles, e.g., moving slowly, small and mindfully; distributing work through your whole skeleton, not doing any movement that is straining or painful in any way, beginning to know what our movement habits and patterns are, where we find resistance or limitation and where there is ease. Then the nervous system is engaged and the updating of the brain map begins. If you’ve been hesitating coming to class, or have been only once or twice, I invite you to join us for class next week. It will help you feel more confident about the process and your relationship to improving your learning and moving. Please come 15 mins early to your first class and be sure to let me know you are coming. I will confirm that I’ve heard from you and send you the class handout if you don’t already have one. That way, we can arrange to talk before class, either via email, on the phone or meet face to face. Or you can contact me using the form on this website, at the top right hand corner. In any case, let me know if you have any questions, or something to discuss. And when coming to class, be sure to dress warmly in layers. Bring water, a blanket and towel. —Saturday 10-11:30am at 250 Bell St., park in front and come in the front door. Happy Sunday! Looking forward to seeing you. During the winter months when the weather is often cold, snowy, or rainy and unpleasant, Feldenkrais Awareness Through Movement classes in Reno pretty much always occur as scheduled. The atmosphere inside is heart-warming, healthy, open, mindful and friendly -- no matter what the weather is doing or what the world outside is like. I feel strongly that the consistency of classes is an important part of developing our commitment to wellbeing, self-care, and/or healing or improving whatever elements of personal growth that we are working on. And equally important, that this commitment helps everyone around us and beyond. Intention is powerful. Thus the only time I cancel a class is if the weather and/or streets are genuinely dangerous or if I am sick. Otherwise classes go on. If only a few people attend, that is fine. Lucky for them! It just means that we sometimes have smaller, more intimate, lively groups, with more individual support and sometimes a little more playful. Valentines Day at the Reno Buddhist Center on Valentine's Day, Feb. 14 was one of these; we ate chocolates together and did my favorite seated lesson, an interesting, rich and varied lesson that includes working with the eyes and the entire body. We are doing the same lesson tomorrow at 250 Bell St., 10 am, and I will be there. If I ever do cancel a class, I will text you if I have your phone numbers. I will also post a notice here on my website, and on both of my facebook pages. And you can always contact me to ask if you have a concern. But generally speaking, I don't cancel classes unless the weather is truly treacherous (which actually has never happened), or if I am sick or out of town, and neither of those things happens often. So now you know. I'll see some of you tomorrow! Just drive safely if the roads are icy. I'll be there. Whole body + eyes workout in a seated position. Feldenkrais® class week of Feb. 4-9. A chair lesson that works on the whole body, connects to the pelvis and improves turning, while aligning and organizing your skeleton, AND working on vision. CLASS THIS WEEK: (all 3 days, we will study the same lesson) Tues Noon - 1:30pm, 250 Bell St., Thurs 5-6:30 pm, Reno Buddhist Ctr., Sat. 10 am-11:30 am, 250 Bell St. Please join us! Use the contact form above right if you are a first time student or want to ask questions, get more information. Plan to come 15 minutes early, and email me for the class handout. Dress warmly, wear layers, bring a blanket or similar, and water. Looking forward to this great class and to see you there! Injuries are awful and many are avoidable. Learn to stop injuring yourself in 2019! Reducing injury by increasing self-awareness, internal stability and strength with Feldenkrais! Let’s face it — injuries are horrible, ghastly. They happen quickly, and suddenly we are hurt or in the hospital. Life gets painful, scary and complicated. With serious injuries like broken bones or severe tissue damage, our problems accelerate. It makes sense, as chaotic and difficult as life is now, to minimize the likelihood of injury causing accidents. The first is things that happen to us because we aren’t paying attention to our environment, like falling because we tripped on a rug or a dog, or running into something because we weren’t looking, or hurting ourselves with a tool by not watching what we’re doing. The second is different — injuries that happen because we aren’t paying attention to our bodies. Our bodies routinely send us signals (discomfort/pain) that something needs to change, but we ignore them or don’t recognize the warning; or don’t take it seriously, thinking somehow that pain is OK: the “no pain, no gain” mentality. Then suddenly we’ve herniated a disc, torn a muscle or ligament, or worse. And there is no “do-over.” It’s too late. The accident has happened. In Feldenkrais, we step back and find a better strategy. The first step is to acknowledge that we live mostly in our heads, with little awareness of our physicality, meaning we’re mostly unconscious of our bodies in space. We don’t feel our feet on the ground or our bottoms in our chairs; we have no clear idea how we move at all. If we get interested in noticing our bodies and movement, we work with our nervous systems in a totally new way. This helps neural pathways form and new brain mapping occur. The Feldenkrais Method classes and private sessions, aka somatic education or neuromuscular re-education, does this with slow, small, non-habitual movements, teaching us about our movement habits, revealing what is easy for us, and, what is not. Learning about our habits is critical because they contribute to our pain, weakness, lack of balance, bad posture, and disconnection between body and brain — all things that can cause injury. This means we develop new connections with our skeletal structure/support that our brains recognize quickly and instinctively. We can avoid injury because of this increased awareness. We feel our bones — and a new relationship is formed connecting us with the ground below. This affects our balance, alignment and how we move. We “occupy” our bodies more fully, with confidence and intelligence because we sense our skeletal support. Look at people on the street or in your office. Very few move with awareness or a sense of conscious connection to themselves or the environment. When they do, you can see it and it is impressive. Stand and notice which leg and foot you stand on more. Shift your weight from foot to foot. Feel the difference. Visualize the lines of your legs, from your feet to knees, to your pelvis. Wiggle your toes, feel how the bones in your feet and ankles provide support for the rest of your body. Notice gravity coming through the bones in your feet; practice standing with pressure on different parts of your feet. Hold onto something for stability; keep your movements small and slow. Revisit these skeletal connections often and re-experience them. This will help you begin the process of increasing body awareness and reducing accident and injury in your life: from your yoga class, to the gym, to your home. Improving your connection with yourself, engaging your brain and body, and being more effective in the world around you is a fabulous way to start 2019! Wishing you an accident-free, more conscious and joyful new year! "I attended this class this morning. It was my first ever Feldenkrais Method experience. I was utterly gobsmacked at the wonderful difference in my body from the beginning of the class til the end. Thank you, Carole. You made my day! Your class will have a positive effect on my health and wellness all week until the next class." If you want information about classes or the Feldenkrais Method, please use the contact form above right to contact me. There is so much you can learn to do to feel and move better and more comfortably! Welcome to Reno Feldenkrais -- a real pathway to intelligent movement and a more vital and transformative life! (2) When coming to your first class, contact me privately and plan to arrive 15 mins early if we haven’t already met. This is so I can be aware of your interest and aims in attending classes and is a great help to us both. (3) If you use Facebook, I post abundant educational and interesting, useful short videos of lessons that address related anatomical, physical and movement issues. Please visit and like my page, www.facebook.com/RenoFeldenkrais. (4) Functional Integration sessions are available by appointment. These are the individual, hands-on component of the Feldenkrais Method and will help you fast track your improvement, or focus on specific issues to get you ready to attend classes. People with long-term or chronic issues do well with Functional integration. It does not, however, substitute for classes. (5) Write me if you have questions; telephone appointments are also free and I’m happy to talk with you about how Feldenkrais may help you meet your goals. This site is for sharing information about Feldenkrais Method®. The information included on this site is for educational purposes only. Nothing on these pages should be construed as an attempt to offer medical advice or treatment. Sign up for my monthly newsletter - I promise I'll never share your info.